(left to right): Mr Joseph Lukaitis AM RFD, A/Prof Stuart Mazzone, Ms Alexandria Driessen, Mrs Lyn Parkin, Professor Gary Anderson, Mr Adrian Trubiani, and Mr Min Simankevicius. 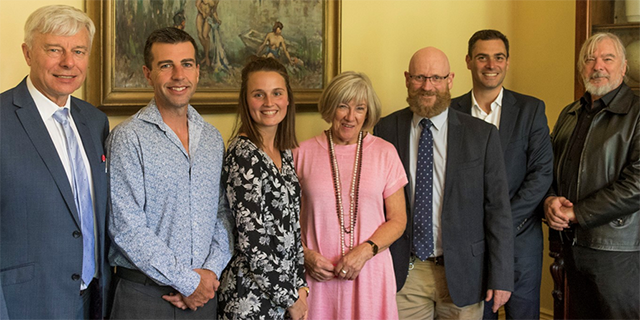 Hosted by the Director of the Lung Health Research Centre, Professor Gary Anderson, the event was a wonderful opportunity to thank the Picchi Brothers Foundation Board and to introduce them to the inaugural recipient, Ms Alexandria Driessen. Established by the Foundation in 2017, this prize provides $10,000 to a student who is pursuing research relevant to asthma through the Faculty of Medicine, Dentistry and Health Sciences. Ms Alexandria Driessen completed her PhD in 2018 investigating novel neural mechanisms involved in the symptoms associated with asthma and other respiratory diseases. Her research has been supervised by A/Prof Stuart Mazzone, who leads the Mazzone laboratory in respiratory sensory neuroscience which is internationally renowned for its work in cough and respiratory sensation. For Ms Driessen, who suffers from asthma herself, she is particularly inspired by the potential her research has to find better treatments for chronic obstructive respiratory diseases. The Picchi Brothers Foundation was established in 1993 by Pietro and Antonio Picchi for the purpose of supporting Asthma and Cancer medical research in the State of Victoria. The Foundation’s hope is that through investing in other organisations who have the expertise in these fields, they will help researchers work towards finding a cure. The Picchi Brothers Foundation Prize for Excellence in Asthma Research will be available again in 2019. Read more here.